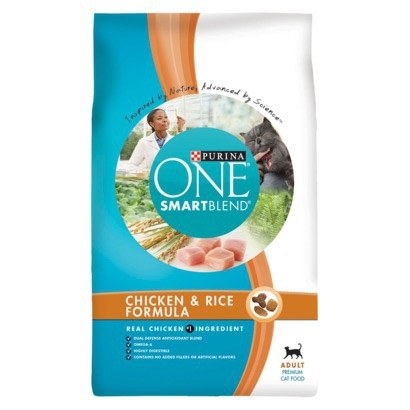 Purina ONE adult cat chicken & rice is a high quality protein, including real chicken which promotes a lean, energetic body and strong muscles. The highly digestible ingredients formulated with yogurt and other highly digestible protein sources helps ensure optimal nutrient absorption. An antioxidant-rich, complete and balanced nutrition helps support a strong immune system. Also has low magnesium for a healthy urinary tract. Purina ONE adult cat salmon & tuna is full of high quality protein, including real salmon & tuna which promotes a lean, energetic body and strong muscle. It's easy digestible ingredients, formulated with yogurt and other highly digestible protein sources helps ensure optimal nutrient absorption. The omega fatty acids and Vitamin E nourishes the skin and provides a shiny coat. The antioxidant-rich nutrition helps support a strong immune system, so your cat will stay healthy longer. 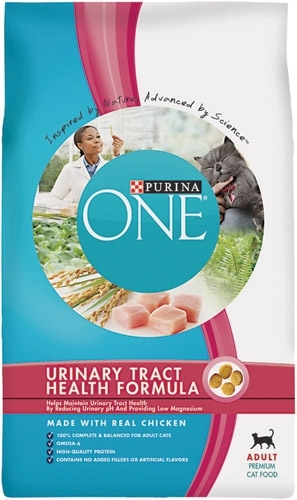 Purina ONE Cat Special Care Urinary Health is for a Normally Active Adult Cat - Helps Maintain Urinary Tract Health Reduces Urinary pH and Provides Low Dietary Magnesium. Purina ONE Growth and Development for Kittens is formulated with DHA a nutrient also found in a mothers milk which helps with vision and brain development. Contains an optimal balance of protein and calories, and is antioxidant-rich for a complete and balanced nutrition so your kitten can develop a strong immune system. Purina One Cat Advanced Weight Hairball is for a normally active adult cat. Provides a high level of nutrients due to increased nutrient absorption - Helps minimize the formation of hairballs before they start. Purina ONE Senior Protection has an optimal protein level which helps older cats maintain lean body mass for strong muscles and muscle mobility. The Omega fatty acids and Vitamin E nourishes the skin and provides a shiny coat. The antioxidant-rich nutrition helps support a strong immune system and is formulated with yogurt and other highly digestible protein sources. Also contains natural sources of glucosamine for muscles and joints. Cat Chow Naturals 6/3.15 lb. Crunchiness that leads to happiness. Celebrate the special bond with your cat with Whisker Lickin's® Crunch Lovers™ treats. Crunch Lovers™ treats have a special flavor basting to ensure your cat will get a burst of the taste she loves. You will capture your cat's heart when she bites down and enjoys these crunchy treats. Opening Purina® Deli-Cat is like opening the door to the deli for your cat. She’ll love the delicious combination of turkey, fish and liver flavors. Every serving provides great taste and 100% complete and balanced nutrition. Dr. Elsey's Quality Products for Cats launches a new product called Urine Removal Program. This product will be a tool for clients to clean up urine odor and stain. Dr Elsey's Precious Cat Long Haired Cat Litter 8 lb. Precious Cat Long Haired Cat Litter™ is an amorphous silica gel infused with hydrolyzed herbs to draw cats to the litter box. Dr. Elsey's Precious Cat Senior Cat Litter 8 lb. Precious Cat Senior Litter™ for senior, arthritic, overweight,and pregnant cats addresses the medical and uriniry tract problems that specific group of cats experience with an amorphous silica gel litter infused with hydrolyzed herbs. Pro Plan Turkey & Giblets Entre for Adult Cats is made with real turkey for exceptional nutrition and palatability. It is specially formulated to help bolster your cat's key protective systems - the immune system, digestive system and skin & coat system - and supply the energy and nutritional needs of a healthy adult cat. 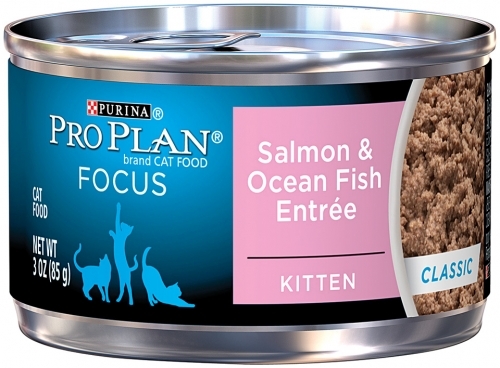 Pro Plan Salmon & Ocean Fish Entre for Kittens is made with delicious, healthful fish. Not only does it help bolster your kitten's developing key protective systems during this formative stage - the immune system, digestive system and skin & coat system - it also is formulated to supply your kitten with energy and the building blocks needed to grow healthy and strong.